The European Space Agency (ESA) is partnering with NASA on a new space mission that will study gravitational waves from space. Known as the Laser Interferometer Space Antenna, or LISA, the project was approved by ESA’s Cosmic Vision science program on June 20. Both space agencies will now work together to design the mission and outline a budget for it prior to construction. The concept for LISA involves three spacecraft placed into a triangular array, each separated by 1.6 million miles (2.5 million km), which will follow the Earth in its solar orbit. On board each spacecraft will be a shielded device known as a test mass, which responds only to gravity, ignoring other forces. These test masses will be linked together by lasers, which will be sensitive to the tiny changes produced by gravitational waves. NASA and ESA have already spent decades developing technologies LISA will require, such as systems for measurement, control, and micropropulsion. ESA’s LISA Pathfinder successfully demonstrated a technique known as drag-free flight – a method of flying that does not disturb test masses, which LISA’s three spacecraft will have to do – last year. Testing showed this technology to be capable of the precision and sensitivity LISA will require. Technologies pioneered for LISA will also be used on the GRACE Follow-On mission satellite project scheduled for launch later this year to replace the aging GRACE satellites. This joint project between the U.S. and Germany will test the ability of the satellites’ Laser Ranging Interferometer to detect minute distance changes between two spacecraft. Initially predicted about 100 years ago by Albert Einstein as part of his theory of general relativity, gravitational waves are produced by massive accelerating objects, such as two merging black holes, which generate waves of energy that radiate through space-time. They were first detected indirectly in 1978 in the form of very small changes in the movement of binary neutron stars, stellar remnants produced in supernova explosions of precursor stars. Scientists studying the pair of neutron stars found that energy was leaving the system in just the amount predicted by theorists of gravitational waves. Direct detection of gravitational waves first occurred in 2015, when the National Science Foundation’s Laser Interferometer Gravitational-Wave Observatory (LIGO) confirmed a signal coming from two merging stellar-mass black holes approximately 1.3 billion light-years from Earth. 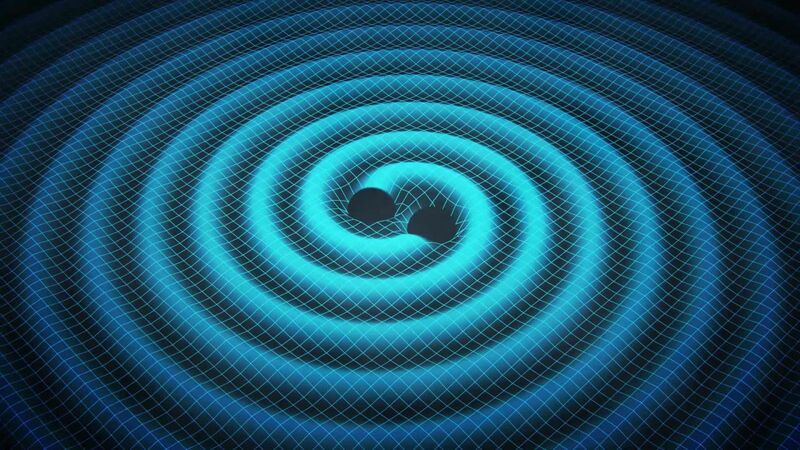 Since then, several similar signals have been detected, all coming from merging black holes. Because LIGO is ground-based, it is capable of detecting only high-frequency gravitational waves at about 100 hertz (or cycles) per second. Interference from seismic, thermal, and other activities that produce noise make it impossible for the observatory to detect any frequencies lower than about one hertz. As a space-based observatory, LISA will not suffer from these limitations and will be capable of detecting signals from extremely powerful activities, such as mergers of supermassive black holes at the centers of colliding galaxies. Much larger than stellar mass black holes, supermassive black holes have millions of times the mass of the Sun. LISA will sense gravitational waves coming from a range of events, such as binary systems comprising two neutron stars or one black hole and one neutron star. Production of these waves shrinks the orbits of the two objects in the binary system. 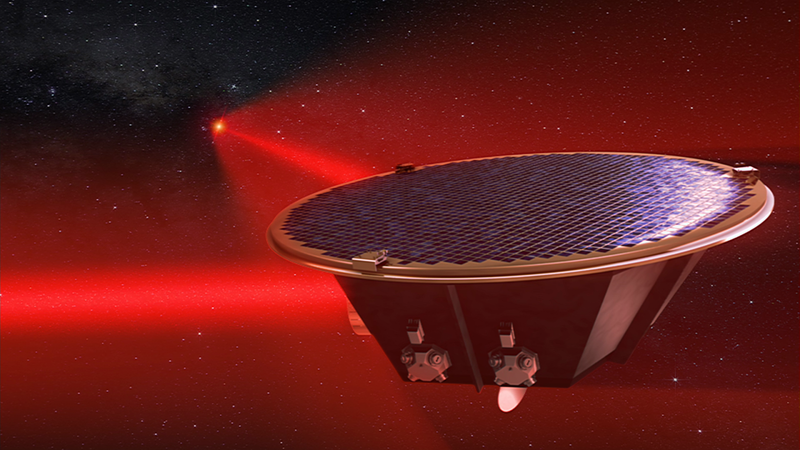 Scientists hope LISA will also be sensitive to background gravitational waves produced in the early universe. LISA is scheduled to launch in 2034. This visualization shows gravitational waves emitted by two black holes (black spheres) of nearly equal mass as they spiral together and merge in an event like GW170104. Yellow structures near the black holes illustrate the strong curvature of space-time in the region. Orange ripples represent distortions of space-time caused by the rapidly orbiting masses. These distortions spread out and weaken, ultimately becoming gravitational waves (purple). This simulation was performed on the Pleiades supercomputer at NASA’s Ames Research Center. Credits: NASA / Bernard J. Kelly (Goddard and University of Maryland Baltimore County), Chris Henze (Ames), and Tim Sandstrom (CSC Government Solutions LLC).